Chinese acupuncture is a popular mode of treatment and it is a significant branch of Traditional Chinese Medicine. It is believed to be practiced for more than thousands of years. It can be helpful in addressing various conditions (see below). The treatment can be surprisingly painless and relaxing, even though needles are the main feature of Chinese acupuncture. The needles are pushed into specific points in the body commonly regarded as acupuncture points or acupoints. Around 365 acupoints are scattered on the human body. These are connected by energy pathways termed as meridians. The energy which circulates the body is called Qi and is part of maintaining the balance in the body. Needles used in Ancient China were unlike the modern needles used today. Back then, the needles were carved from either bones or stones. But thanks to advancements in technology which included the improvement of acupuncture needles, clients feel little to no pain because of modern needles, though sharp are ultra-thin and made of stainless steel. The practice is so old, that it’s exact development is unclear. Of course, theories abound. 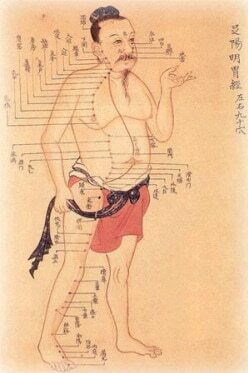 One is that the first physicians were also Taoist Monks & Martial Artists, who developed extra-sensory skills, including having visions of the first acupuncture charts. Chinese Medicine theory is also ancient. It considers magnetic-electric force fields, cosmology, the energetic effects of climate changes, the effect of emotional stress on the immune system and our organs. Concepts that modern research is now demonstrating. Chinese acupuncture has stood the test of time and is now used in most countries, and in many hospitals, including hospitals in Melbourne. 95% of our Melbourne patients here are pleasantly surprised that they don’t even feel the insertion of the needles, and within minutes, the stimulation of neurotransmitter release such as endorphins, makes acupuncture an amazingly relaxing experience for the vast majority of people. And then there’s the specific benefits of it. It is difficult to answer this question quickly & do the medicine justice. It’s the same as expecting a simple answer to how does Western Medicine work or how does physiotherapy work? We can say that Acupuncture works with the body. We can say that it helps the body to achieve and maintain homeostasis. It sends signals through the body for specific effects. We can see these effects as blood pressure changes, neurotransmitter release, circulation changes, nerve impulse changes and more. Acupuncture done under brain MRI is particularly interesting. Essentially, a Chinese Medicine practitioner assesses the state of Qi, Yin & Yang in a presenting patient. This is mainly done by asking questions, looking at the tongue, feeling the radial pulse and the abdomen. Here at Freedom Chinese Medicine in Melbourne, we can surprise you with how well we can read your body & tell you what’s going on. There are over 350 acupoints and these lie along the meridians. By stimulating these points with needles, heat or finger pressure the Qi can be balanced. What Happens in a Chinese Medicine Consultation? Traditional Chinese Medicine recognises you as a complex blend of body, mind and emotion. At our clinic in Melbourne, during the first visit, your practitioner is concerned with all aspects of your health. Details of your medical and family history, occupation, diet and exercise habits and other relevant information are collected. The tongue and the pulse are also studied to assist diagnosis. This allows an overall assessment of your current disorder, and gives an understanding of its cause. Your practitioner can then give you guidance as to what treatment plan would best suit you and a prediction of how many treatments may be required for you to achieve optimal health. At Freedom Chinese Medicine, we are very honest and upfront about what we believe could help, even it means referring you to another practitioner. If that’s what you need, we’ll do it. If Chinese Medicine could help you, your treatment may involve acupuncture, herbal medicine, nutritional support, cupping, moxibustion, lifestyle advice or a combination of all. We will tailor treatment to whatever is going to help you the most. Only single-use, disposable needles are used for Acupuncture at Freedom Chinese Medicine, which is usually the case in Melbourne, Australia. If you would like to know more about what we do and how we could help you & your loved ones, please call us on (03) 9486 5966.
evidence, fourth edition, 2015. The Medical journal of Australia. 2016;204(8):315-7.